Tom Lin inside the new Alki Chicken and Waffles at 2738 Alki Ave SW said he's bringing back one of the most iconic recipes in Seattle history. The fried chicken once served at the historic Alki Homestead will be the featured entree on the menu. 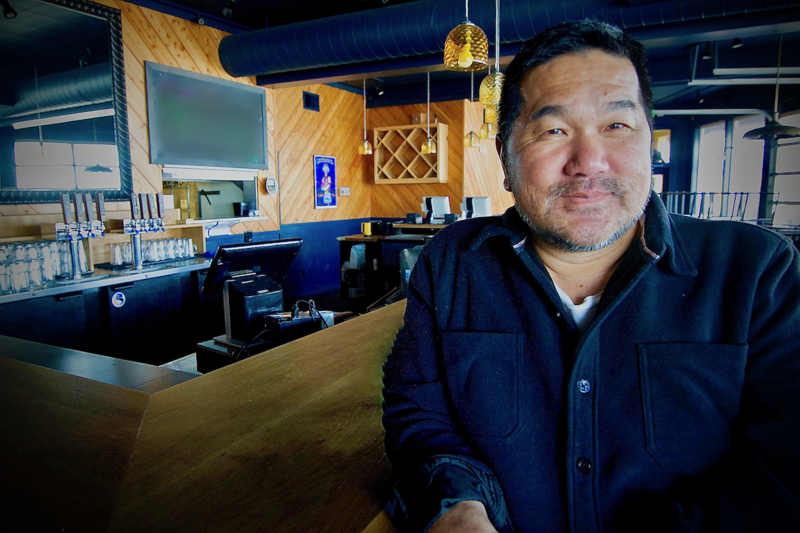 Lin, former owner of the Homestead has retained the secrets from the original restaurant and will offer it in a new contemporary space on Alki Beach. If you had set the date on your calendar for the opening of Alki Chicken & Waffles you will have to wait a bit longer. Hiring issues and logistics have delayed the opening “until early May at least,” said owner Tom Lin. He said the new restaurant was waiting for the health department's approval and expected the liquor license to come through soon. Lin said he was also working on some sort of "to-go" packaging aimed at beach goers and was considering delivery directly to people on the beach itself, though this idea was still being worked out. One of the most famous and fondly recalled recipes in Seattle history, the fried chicken from the Alki Homestead is coming back. Opening on April 15, at 2738 Alki Ave SW, Alki Chicken and Waffles will feature the iconic dish in an updated and yet familiar setting. You can count on it being authentic since the former owner of the Alki Homestead, Tom Lin, preserved the secret recipe and will offer it in a streamlined menu with some modern touches. The space was once home to the Seaside Pharmacy, then later the Alki Bakery, then Fatburger, and most recently a New Orleans themed spot called B's Po Boy. The original Alki Homestead structure, just two doors away on 61st SW, was badly damaged in a fire in 2009. Lin went through years of attempts to restore the historic structure before finally selling it Dennis Schilling who managed to complete the work this year. Il Nido, an italian restaurant will open in that space this spring. Alki Chicken and Waffles will offer organic, local chicken, made in the classic manner, "Eight pieces at a time", said Lin who emphasized that this is not fast food, it's "old fashioned food," which doesn't mean it will be slow, just made in a more traditional way. They will offer three different varieties. Pricing on the entrees is still being determined as a local supplier is still being negotiated but the ten side dishes from fried mushrooms to fried zucchini to mashed potatoes and gravy will "all be one price, $3" said Lin. Waffles and other breakfast items will be served in the morning (they will open around 7am), and of course with the chicken in entree form. The restaurant will stay open until 9pm. Inside, the decor will be traditional too with mix and match "garage sale" style chairs and tables, "cream, linen white interior", chandeliers and other homey touches Lin said. Two electric fireplaces will be added to provide warmth. The exterior has been repainted an ochre yellow (replacing the dark blue of the former tenant B's Po Boy and signage will go up in the next few weeks. A website for online ordering and social media presence are in the works too. The space is being remodeled to reduce the size of the bar, and put seating around it. "We're a restaurant, not a bar," said Lin but he explained that the bar would still serve beer, wine and cocktails on order. It will seat approximately 95 people. The famous chicken will be available to go and via delivery but how that is accomplished is not set yet. "We might deliver it ourselves," said Lin instead of relying on one of the many food delivery services. In any case that won't be offered immediately since they need to get their systems worked out and determine the level of demand. If the demand is as strong as he anticipates, Lin said he has plans to open as many as three others within the next year in the greater Seattle area. There is even a food truck nearly ready to go which Lin said could make its debut this summer. Fried chicken in West Seattle is available from the well regarded Ma Ono, Endolyne Joe's and Harry's Joint but Harry's is said to be closing this summer as the owners are choosing to retire. The former KFC closed last year which meant those seeking the dish could have gone to White Center or opted for Popeye's or the more trendy Bok a Bok. In any case, the Alki area hasn't seen, or tasted, the original Alki Homestead recipe in over a decade, but it hasn't faded from memory. The owner of Il Nido said the most common question he has gotten is, "Will you be serving the fried chicken?" Finally it will be back, much to the joy of the multitudes who missed it. So happy to see a new place opening soon! Welcome to the neighborhood. We hope there’ll be some vegetarian options. Can't wait.....This will be a big hit. Nice! Thanks, Tom. Can't wait to try it! Even if it can’t be in the log building, it will be nice to have that chicken back! I've missed the Homestead, have many fond memories of it. This is great news to be getting our fried chicken back! Can't wait for opening! You forgot to mention that after the bakery and before Fatburger, it was the bistro.